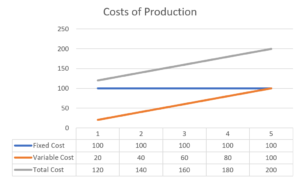 What is the Marginal Cost of Production? Then its marginal cost is the first order derivative of the total cost function. In this case, the marginal cost is directly equal to its variable costsFixed and Variable CostsFixed and variable costs are important in management accounting and financial analysis. Fixed costs do not change with increases/decreases in units of production volume, while variable costs are solely dependent on the volume of units of production. This guide teaches an analyst the fixed vs variable cost methods. However, costs may not vary directly on a per unit basis. It is possible that increasing production by a unit may not cause a proportional increase in costs. This is because different business activities face different forms of cost behaviorsCost Behavior AnalysisCost behavior analysis refers to management’s attempt to understand how operating costs change in relation to a change in an organization’s level of activity. These costs may include direct materials, direct labor, and overhead costs that are incurred from developing a product..
Unit costs would be the traditional idea of variable costs where an increase in a single unit of production leads to a proportional increase in costs. For example, the cost of materials required to produce another coffee mug. Batch costs would vary not by the individual unit of production but by the number of batches for a given number of units produced. Taking the coffee mug example further, a ceramic shaping machine may need to be brought up to an optimal temperature before production may begin. Beyond this point, there are no additional costs to operate this machine until production is stopped. Beginning the next batch would then incur this startup cost once more. 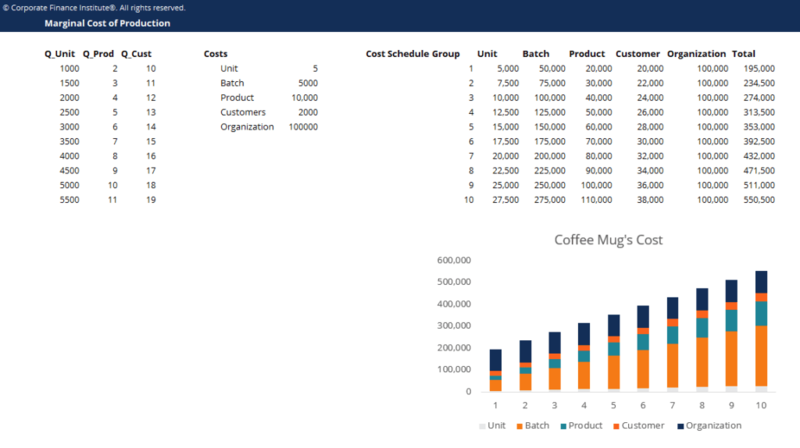 Product costs occur regardless of the number of batches or units produced. This is a cost that is attributed directly to a particular item on a product portfolio. For instance, the cost to design and market a holiday variant of a coffee mug would not be affected by the number of mugs produced. Customer costs are incurred by the number of customers serviced instead of any particular level of production or expansion of a product line. This could be in the form of after-sales service or legal costs resulting from a contractual agreement. Organizational sustaining costs are costs that are incurred as a result of general business operations. These are costs that are incurred regardless of any quantity of production. These might include such things as the fixed salaries of employees at the coffee company or auditing fees for preparing financial statements to shareholders. For example, Coffee Mug Company faces an annual cost of $100,000 in the form of organization sustaining costs. The material and labor costs required to produce a single coffee mug are $5/unit. For every batch of 100 units, Coffee Mug needs to warm up its machines at a cost of $5,000. Typically, the cost to design and market a product line comes to $10,000. As a result of Coffee Mug’s business model targeting wholesalers and large retailers, it services a few large customer accounts that require servicing costs of $2,000 per account. In this example, marginal costs for various activities exist. The marginal cost for one additional unit produced is either $5 for any unit except the 101st, 201st, etc. where the marginal costs would be $1,005. The marginal cost of introducing a new product line would be $10,000. Servicing one additional customer would cost $2,000. When will a firm find the optimal level of production? A firm will continue to produce additional units as long as the marginal costs are less than the marginal revenue.